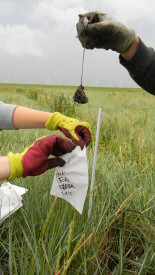 We use commercially available tea bags as standardized test kits to gather data on salt marsh decomposition rates. This is a cost-effective, well-standardised method. By using two tea types with contrasting decomposability, we can construct a decomposition curve using a single measurement in time. We will compare the decomposition rate within the high marsh and low marsh, and also in the warmed chamber versus ambient reference. Our data was also included in a worldwide cooperation network to investigate the decomposition rate in different ecosystems using the tea bag method.